Is anyone as excited as we are to celebrate Cinco De Mayo this Friday?! We love any excuse to throw a good fiesta, so when our friend, Amy, of Amy’s Party Ideas decided to host a cactus-themed fiesta using our Fiesta Like There’s No Manana collection, we couldn’t wait to share with you. Whether you’re planning to celebrate on Cinco de Mayo or are planning a Fiesta themed girls’ night out – read on for festive tips, tricks and inspiration! Let’s fiesta! I love any reason to eat tacos and celebrate, and on my last visit to Swoozie’s I fell in love with their fiesta products! This year for Cinco de Mayo, I am hosting a cactus themed fiesta and I can’t wait to show you how it all came together! So grab a taco and some guac, and get planning! I will share more after the photos, and be sure to see my favorite products for your fiesta down below. Live every day like it’s Taco Tuesday friends! Set the tone for your celebration with a cactus themed invitation. I adore this one from Swoozie’s! I love to set the table for my friends and when you can keep food on the table, you spend less time in the kitchen and more time hanging with your friends. And everyone can keep eating without having to get up to find more food. When we are dining outdoors shatterproof glasses are a must, and these personalized govino glasses are just what is needed. I love the palm leaf vinyl personalization too! When planning my centerpiece, I let the food be the star and filled in with a floral arrangement I made using unique offerings from my local flower shop. A cactus in an empty Mexican food can, and a really pretty cactus from the local big box hardware store add to our theme. I just love the food truck centerpiece! I decided to serve fresh fruit in paper cones on the top of the food truck. (A tip: I put ice cream cones in each paper cone to help keep the moisture from saturating the paper.) I served Mexican street corn on the bottom layer, and offered fresh limes as garnish for the corn on the middle layer. A plate of fish tacos with honey lime cabbage slaw and fresh mango salsa added to the tablescape. And a bowl of fresh guacamole and tortilla chips rounded out our menu. Mini pinatas make great favors and place cards complete each place setting. A little humor is always fun. I love the napkins that say “My head says GYM but my heart says TACOS”….seriously! 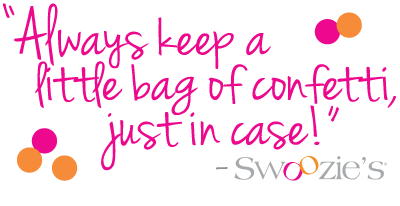 There is no shortage of witty products at Swoozie’s. Keep an ice bucket full of beverages nearby, and vow to live every day like it’s Taco Tuesday my friends! How are you planning to celebrate this year? And what is your favorite Mexican food to eat?